3/25/42 – Decoration from the Chinese Government for heroism; made posthumously. Pre AVG: 1. Joined the California National Guard, Dec. 28, 1914; and, honorably discharged on July 8, 1915, to enlist in the U.S. Navy, at age 17. 2. He performed various duties as an enlisted man in the Navy in the early days of his career. As far back as 1916, he was serving aboard the USS Dale (after which his second son was named) in Asiatic waters. 4. While on a 2-month furlough from the carrier Saratoga, where he was serving as a Naval Aviator, he and another Navy pal drove a small roadster (1928 Chevrolet) from Hampton Rhodes, Virginia, to Oceanside, California, in 4-1/2 days. This noteworthy event was headlined “Hoffman joins Drivers of Fame”. Upon his return from leave, he reported to the Lexington. 5. He flew many different types of aircraft, including the PN-9 Seaplane (Naval Aircraft Factory), Martin T4M-1 Torpedo Bomber, Martin P3M-2 Patrol Bomber, Boeing F4B3 Fighter, Gruman F2F1, Brewster Buffalo, and the P-40B. He was a Flying Chief in VF-2; this was a special program for enlisted pilots in the Navy. He amassed over 3800 hours of flight time. He served aboard the Saratoga, Langley and Lexington, and included flying in Torpedo & Bombing Squadron 2. He did, indeed, love to fly. 6. The Navy decided that anyone with more than 20 yrs. of service was too old to be a fighter pilot and with that, he was reassigned to Jacksonville as a Flight Instructor, which he was not real fond of doing. About that time, General Chennault was recruiting and he “signed up”. He was only about 5 yrs. younger than the General and considerably older than most other volunteers; but, brought with him a tremendous amount of flight experience. 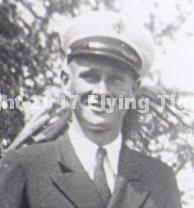 AVG Service: He served as a pilot (Flight Leader) in China and Burma. He was killed in the skies over Burma and crashed near the RAF base at Mingaladon Airfield on 1/26/42. He acquired his nickname from his love of Coca Cola….RIP, Cokey.